Cannabis Churches have been opening up throughout California and other states. Many of these churches have been asserting freedom of religion rights to practice cannabis as a sacrament, among other legal arguments. Cannabis Law Group can help you set up your cannabis church by providing you with legal advice regarding the Religious Freedom Restoration Act. Our law firm can incorporate your cannabis church and prepare your religious and legal documents to show compliance with state and federal religious laws. The Religious Freedom Restoration Act (RFRA) and the Religious Land Use and Institutionalized Persons Act (RLUIPA) are federal laws. These laws provide a shield from improper actions by authorities that extend to certain church groups. These laws may provide protection to those religious groups who use marijuana as part of their religious services. 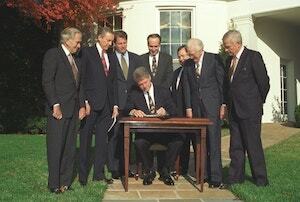 In respect to providing protection against improper federal government actions, the Religious Freedom Restoration Act of 1993 (RFRA) prohibits the Federal government from applying or enforcing laws and rules that substantially burden a person's exercise of religion even if the burden results from laws or rules of general applicability. The RFRA requires the highest level of review - "strict scrutiny" - of federal laws that substantially burden the religious exercises of organizations, groups and individuals. Under the RFRA and RLUIPA, government entities (local, state and federal) cannot discriminate against religious groups through improper zoning and land use restrictions, nor can the federal government implement any general rule or law that improperly burdens religious exercise. Cannabis Law Group believes that certain churches and their beliefs regarding cannabis as a sacrament may be protected from improper and illegal actions taken by government agencies. These legal issues are unsettled, however, and so there is no guarantee that the cannabis church cannot be shut down through lawsuits, fines, evictions and/or criminal arrests. The protections provided under the RFRA and RLUIPA may extend to cannabis based religious organizations. There exists a thorough-going history of case law examples in which Churches with sincerely held beliefs were challenged by United States Supreme Court and the Churches have won. Sometimes, even the federal government can not articulate a compelling government interest through laws regarding the various sacraments, whether it be wine given to minors in the Catholic Church, Peyote in rituals of the Native American Church or even metal head wear for the Church of the Flying Spaghetti Monster, to support prohibiting their religiously held uses. The Court found that laws of general applicability substantially burdened the religious free exercise rights of Churches and that the federal government could not show a compelling government interest that justified burdening the beliefs of Churches and religious exercise by their members. Religious rights under the RFRA were again confirmed by the U.S. Supreme Court in 2014 in a case involving the Hobby Lobby chain of retail stores. Cannabis Churches can in some instances provide information on their beliefs. Similar to other Churches that embrace Christianity as well as lesser established spiritual practice that may have been subject to discrimination and improper challenge by government agencies and entities, the religious beliefs of cannabis church members - like those of the members of all sincere Churches - would be substantially, if not completely, burdened by any prohibition of or interference with their sacredly held beliefs and practices. Cannabis Law Group’s marijuana lawyers can provide information on the federal law enacted to protect minority religions and their landlords from improper local and state government actions and wrongful challenges. Call the marijuana lawyers at Cannabis Law Group today to obtain legal advice and to incorporate your cannabis church. 714-937-2050.